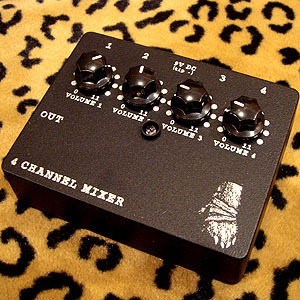 A 4 channel mixer in pedal format. Every channel is fully buffered to eliminate any interaction (tone or volume loss) between inputs. The output has a slight boost so that quieter instruments can be leveled with louder ones without any loss of overall volume. Use it to send up to four instruments into one amp or effects chain or it can also be used to combine different effects chains back into one signal. Mix line level signals like CD or MP3 players with instruments for practice or adding recorded samples into live music. There is a 2-3 week turnaround time on the Mini Mixer because we don't currently have the printed boxes in stock.